This pretty helix stud is available with a 1.2mm x 6mm or 1.2mm x 8mm 316L surgical steel barbell. 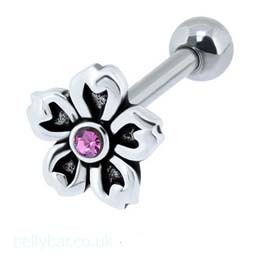 The little flower design measures 7mm, and the surgical steel post has a 3mm screw on ball for securing the stud in place. Powered by ShopFactory to sell P12690 online. All-in one eCommerce and online shopping cart software.